The Dubai police chief confirms he has received a multitude of threats on his mobile from Egypt's Muslim Brotherhood for tweeting against the Brotherhood's win of the presidential elections. "I have received 1500 threats from members of Muslim Brotherhood [MB] and my mobile is still on," claims the Dubai police chief Dhahi Khalfan on his account on Twitter on Saturday, implying that he is still receiving threats. "The number of received phone threats demonstrate that we face a criminal organisation [in reference to the Muslim Brotherhood] ... we disagree with [former Egyptian presidents] Sadat and Nasser (may they rest in peace), yet their regimes did not do what the Brotherhood are doing," Khalfan added. On Friday Khalfan mimicked Morsi, the Muslim Brotherhood's candidate and Egypt's now official president: "I swear by Almighty God that as long as I shall live I will not take or accept an allegiance with any Emirati. I will also not deploy Brotherhood groups to create turbulence and strife around the world - and God is my witness." Khalfan counters defiantly: "We are the son of Zayed [the UAE former president]: we don't make mistakes. Woe to those who do a wrong against us." 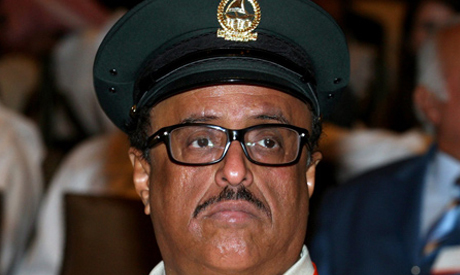 "Morsi will come crawling to the Gulf asking for help," Khalfan foretells in another tweet. Egypt's foreign ministry summoned the ambassador of the United Arab Emirates on Thursday after the Dubai police chief's comments caused a stir. On Thursday, Egypt's official news agency MENA, reported that the envoy to Cairo was summoned to request "clarification from the United Arab Emirates about statements that are not in line with the nature of the special relationship between the two countries." MENA described the statements published on Twitter as an "attack on Egypt." The Dubai police chief, Khalfan, commented on Egypt on his Twitter account after the Muslim Brotherhood candidate, Mohamed Morsi, won the presidential elections. "If they tried to shake the security of the Gulf, bloodshed will be up to their knees," Khalfan wrote on his Twitter account. In other tweets, also after Morsi's win was announced, he said: "An unfortunate choice. The repercussions of this choice will not be light for poor ordinary people."